Retailers have one main objective – sell product. You may have a great price point, a unique offer or quirky packaging, but if your products aren’t flying off the shelves, retailers will quickly loose interest. This is where custom POP displays can help. A well-designed permanent POP display is not only a very effective sales tool, it also provides an aesthetically pleasing addition to a retail location, drawing in customers. Without permanent POP displays, you have little control over where your products will be located and they will typically be placed right alongside competing brands. With permanent POP displays, there are no missed sales opportunities, as displays are typically placed on the end of the aisle or in the centre of a department section, helping your products stand out. Many retailers will even put displays right in the front of the store near to the check-out to increase sales in these high traffic areas. Above is an in-store image of Bedillion Honey’s custom permanent POP display, designed and manufactured by Avante Displays. 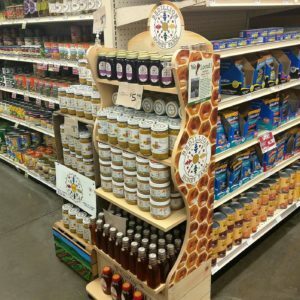 The positioning of the display makes these products much more prominent than those on the generic store shelves and gives Bedillion Honey the ability to showcase much more of its product line. Here are a few more helpful hints, which will help to increase your in-store real estate. Where will your permanent POP displays be placed –a pharmacy, a boutique, a showroom, a grocery store? Whatever the location it is very important that you know and understand the store manager’s theme – is it high-end chic, bargain basement or somewhere in between? You need to design displays that complement the space they are going to occupy. It is also important to be aware of any in-store limitations such as height, width, weight or power (if your displays include any electrical components). It’s all about selling product so your permanent POP display must engage with potential buyers. This can be accomplished through unique design features, video advertising players, informational graphics or the inclusion of catalogs and brochures. When customers are inspired to stop walking by in order to touch any aspect of your point of sale display, you have succeeded. Urges for action can be a powerfully effective sales tool. Gaining more real-estate through the use of permanent POP display does not mean that you should take advantage of the opportunity by cramming the display with every single sku in your product line. A cluttered display can be very off-putting and you need to ensure that your products are visible and accessible. This will make it easy for customers to make an on-the-spot purchase decision and will allow retailers to recognize which sku’s sell and which don’t – remember that product popularity can vary wildly from location to location. Avante can help you to create custom permanent point of purchase displays that retailers will love. Our displays are value engineered, to optimize available floor space and include custom design elements that will draw in customers, add ambiance to the retail location and encourage more sales – it’s a win-win.